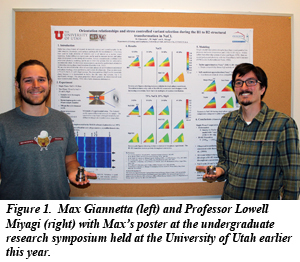 Max Giannetta, an undergraduate student working in the group of CDAC Academic Partner Lowell Miyagi at the University of Utah, has been recognized as the Outstanding Undergraduate Resarcher in the College of Mines and Earth Sciences for 2014-2015. Over the last two years, Max has studied the texture development that takes place during the B1-B2 transition in NaCl at high pressure (Fig. 1). CDAC has supported Max’s travel to both HPCAT and ALS to carry out challenging radial x-ray diffraction experiments to uncover the mechanistic details of this phase transformation. Recently, Max presented this work during the poster session at the 2015 SSAP Symposium in Santa Fe, NM. 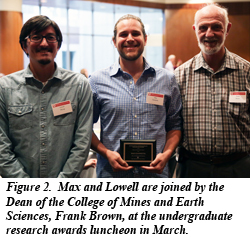 Max was honored for his research and presented an award by the Director of the Office of Undergraduate Research at a special luncheon on March 31, 2015 (Fig. 2). CDAC extends its congratulations to Max and Lowell for this special honor.